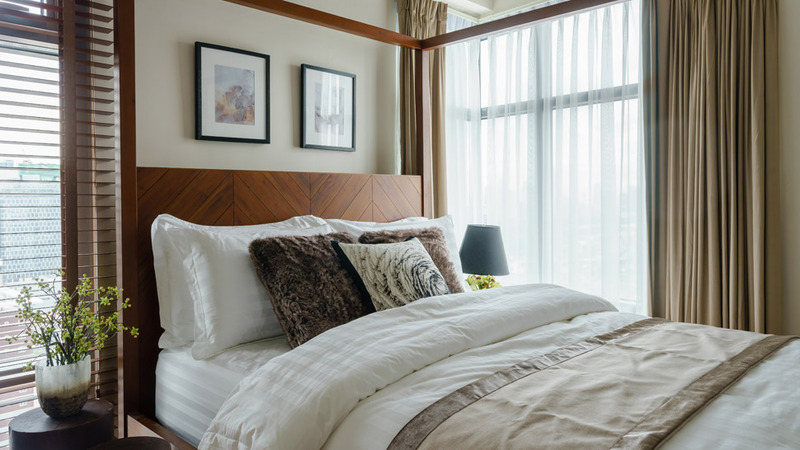 One would think that after years of working in hotels, the owners of this condo unit in Bonifacio Global City will settle for a hotel-like look to make it feel like home. However, once you enter the space, it’s easy to notice that they chose a different path in terms of overall aesthetic. The two-bedroom home is cozy and charming—with well-thought-out pieces that complete the look. “They wanted to make it homey and infuse the place with their personal taste and preferences in terms of décor and furnishings,” says interior designer Anla Li-Tan. Currently based in Jakarta, the couple invested in the unit with plans of using it as a vacation home whenever they’re in the Philippines. The original plan was to create a modern, fully customized space, but to stay within the timeline, Anla and the owners agreed to purchase the furnishings instead. This decision didn’t stop them from achieving a classy and contemporary home the owners would love to come home to. “When we started this project, we were expecting an eight-week turnaround time, but because of the details and personal attention [we gave], it took is twice the time as planned,” says the lady of the house. After months of painstakingly choosing the pieces and accessories for each area, the couple is more than happy to finally settle in. “It is home after all, so every extra day is worth the work,” she adds.